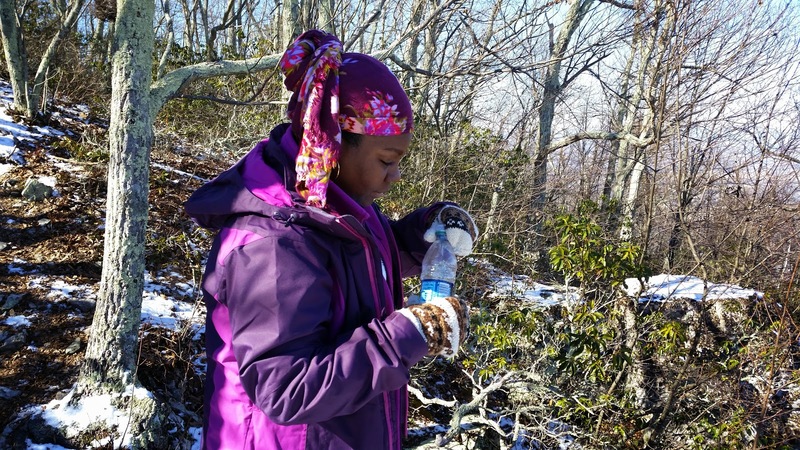 On a cold January 17 hike, we had seen several trees down on the trail between Rockfish and McCormick Gaps, an observation confirmed by District Manager Mark Gatewood. 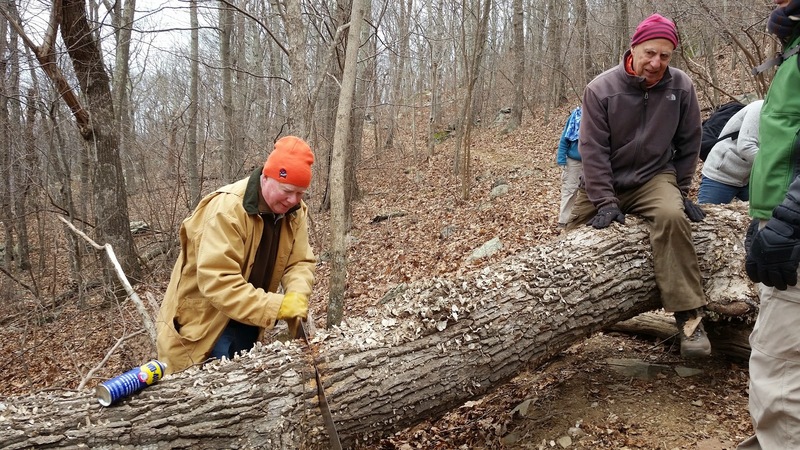 We were hoping for a warmer day for today’s trail maintenance outing to remove said trees. The temperature was a little warmer than it had been in January, but wind howling through Rockfish Gap was very cold and cloudy skies blocked the sun’s warmth, plus water had refrozen on the trail to make this a sometimes slippery winter expedition. I feared there wouldn’t be enough work to keep all of us busy, but by the end of the trip, I was glad we had the people. Joining the group on their first outing with us were Lillibet and Allan Coe—yes, they chose maintenance over before hiking for fun! We were joined at Rockfish Gap by Dave Borzich, a welcome addition to our now 10-strong workforce. After I passed out tools for everyone to carry, I didn’t even have anything to tote except my pack. Following the climb at McCormick Gap, which is easier when not carrying tools, we cleared the first downed log before heading on to the Big One. Seeing the 16-inch log, a government worker made a dire prediction of darkness before this monster was dispatched. Undeterred, engineers Pete Fink and Dave Abdallah predicted that we could use levers to move the log after cutting it in one place, whereas I was less hopeful and started a second cut. Jodi Frederikson wielded the saw with enthusiasm; she did so much sawing throughout the day that she anticipated paying for her effort tomorrow. After members of the A team completed their cut and found a couple of small tree trunks to use as levers, we did indeed roll the big log off the trail and declared lunch break. Expecting fewer workers, I had brought only a small loaf of lemon poppyseed cake, but we managed to stretch it by sharing. Those who had brought hot drinks were glad to have them because the anticipated 50-degree temperature never arrived; no one wanted to linger very long over lunch. The next two logs were not as large, but one did require two cuts to get a movable-sized section. 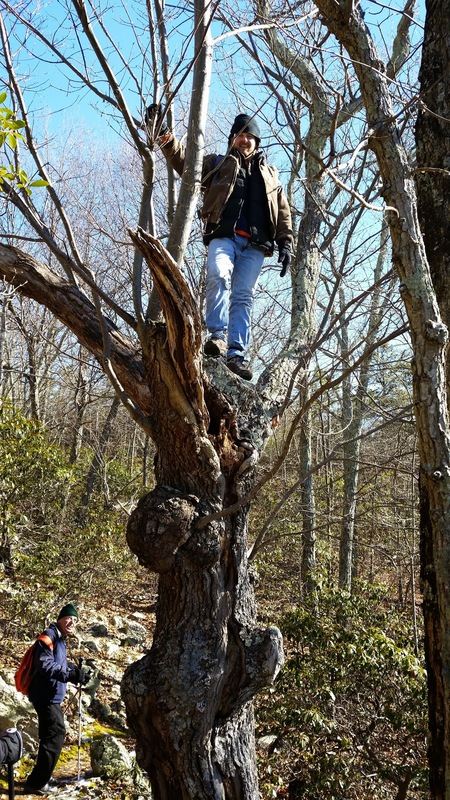 When we arrived closer to Rockfish Gap, I pointed out some of the large trees that Don Davis and Andy Willgruber had cut a few years ago after a derecho had hit the area. Besides one small and three large fallen trees, we also cut a few small trees that leaned into the trail. 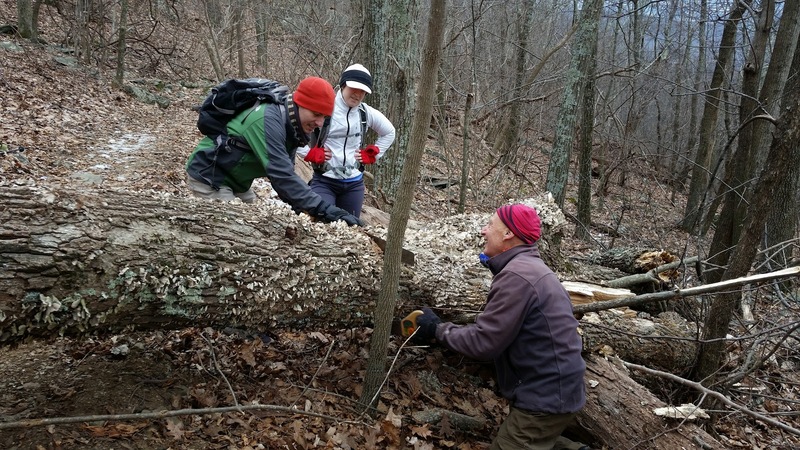 Three people carried loppers and pruners to remove the small branches that soon would have encroached on the trail. We reached the end of the Chapter’s section of the trail about 2 p.m., just as the sun peeked out. Those of us waiting for the car shuttle enjoyed our first taste of warmth for the day while Dave B. took two drivers to get their vehicles from McCormick Gap so we could all head home after a productive day. Others not mentioned who also helped today included Briana Taylor, Bev Maresca, and Marian Styles. We had a chilly, but fun and beautiful hike on Chimney Hollow Trail. 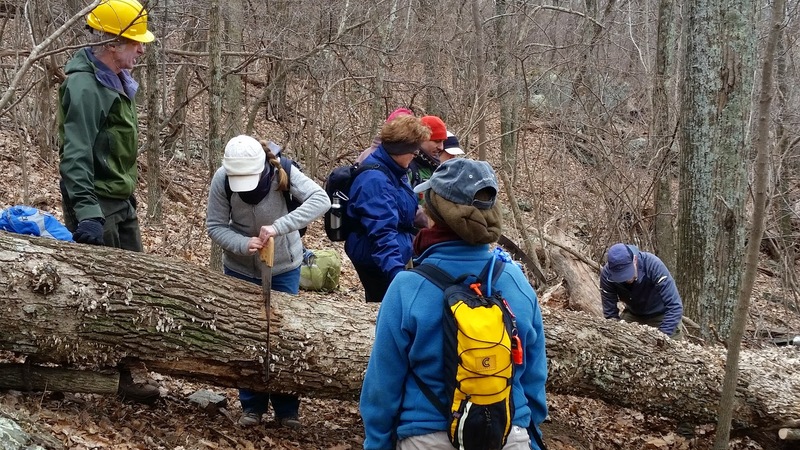 The hike was lead by Barbara Martin who was joined by Susanna Williams, John Brandt, Brian Muszynski, Kelly Guch, Kirsten Elowsky and Michael Johnson. Kelly joined us from Madison, Virginia while Michael and Kirsten traveled from Loudoun County. 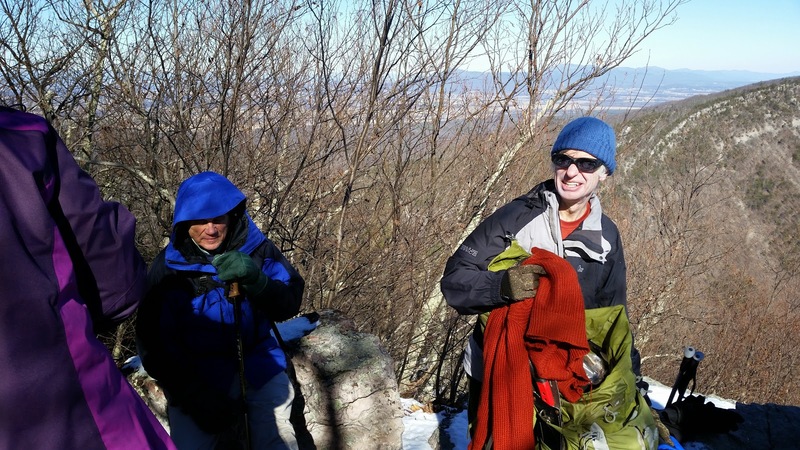 We walked along an ice frosted stream then climbed to beautiful views and had lunch looking out towards the Alleghenies plus the ridge where Shenandoah Mountain Trail goes. Many folks on the hike had not been to this area before and were impressed by the beauty of it all leading to a discussion of future hikes in the area. We were also joined by a frisky 9 year old German Shepherd named Elsa, who entertained herself by chasing sticks and trying to mooch our lunches from us. Thanks to Brian for clearing away much of the blow down in the trail. A great deal of chocolate chip cookies were devoured and a good time had by all. Our group was small - hike leader Barbara Martin and Rex Elliott, who was visiting the area from Maryland and saw the hike posted on the PATC Meetup group. Thank you Jeff Monroe for doing that! We left Staunton with the sky grey and foreboding. By the time we reached Braley Pond the sky was blue and the weather fine. We hiked around Braley Pond and followed the Bald Ridge Trail, which was a fire road for about a mile. We then turned off onto Bald Ridge Trail proper and climbed for about 1 1/2 miles. The views were beautiful and we had lunch. Barbara continued onto the Peak where the views were really spectacular. A beautiful day spent with good company in an area not often explored by our club. On a clear, calm, crisp morning, six people gathered at Albermarle High to take a hike. We met Michael Seth at the trailhead on Madison Run fire road. Scott and a major upgrade from her first. We started by using big rocks to cross a wide stream, followed by what is reported as the sixth steepest trail in Shenandoah National Park. As expected, the climb caused people to remove some clothes and spread out. We regrouped at the trail to the summit, and then headed off to the rocky overlook at the end of the spur trail and spread out for lunch. The amount of chocolate raspberry cake consumed by some health-conscious people led me to conclude that I was correct in extolling said cake’s benefits (beyond tasting good). Lunchtime entertainment included Brian Muszynski giving demonstrations of what parents might tell their children not to do. As usual going downhill on the return was faster than the morning uphill. At the crossing of Madison Run, Tia hardly slowed down when crossing rather than her cautious morning crossing, showing rapid mastery of hiking on non-paved surfaces. We still had not felt the wind that some forecasts warned us of. 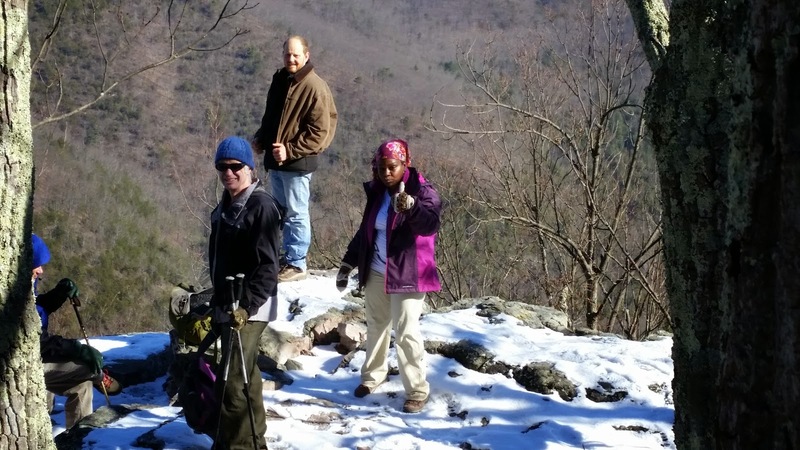 Also on the hike were Susanna Williams, Leon Gorman, and photographer Sunny Choi.